We knew this year will be taken to a whole new level of craziness. Why? Florin has been named the National Shotgun Coach for the Junior Team - yay! congratulations to my lovely hubby and coach!! On top of that, being a PanAm Games year, and Toronto being the host, he has also been asked / tasked with being the coach for the team. Which meant a couple of extra trips for him, as coach. What's wrong with that? Absolutely nothing - however, if he's not here, half of me is not here... which means half of the work doesn't get done. On top of that, I get some extra work on my plate, from all the 'make the luggage-unmake the luggage' every 3 weeks. With all the extra training and competitions this summer, we had to also re-arrange our school's travel schedule. And our personal one - so we had a very early vacation this year, and I'm afraid that's all we'll get. Which gets me to the tutti fruity subject. In February we took our first real-real vacation in 10 years. 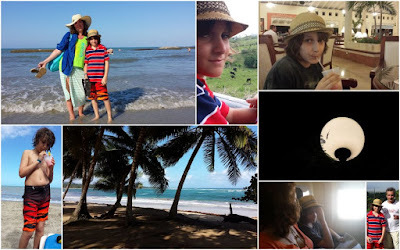 Last time we went to the Caribbean, on a vacation, in an all-inclusive resort was exactly 10 years ago, almost to the date (early April then vs. mid-February now). Oh, what a beautiful trip! All I had to care about was packing for all of us for a week. That's it! This time we chose the Dominican Republic, we wanted to see how the small islands are - they are wonderful! We had sun, beautiful beach, a 'safari' (a trip through the mountains, to learn more about how they live and what they do there), waves, pool, full service... and, of course, hats! :) It was a wonderful trip and sadly it's already so long in my past, it almost feels like it happened eons ago. Oh, well, no complaints. 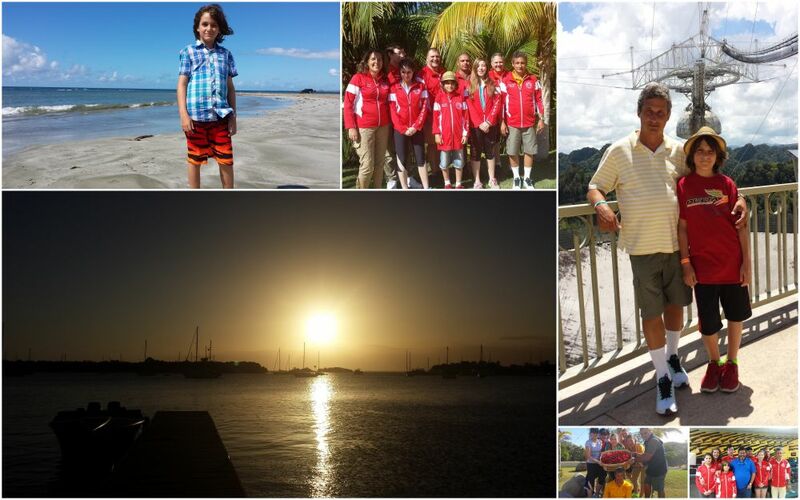 Exactly a month after this trip, we went on our first training camp with the team - in Puerto Rico. It looks like the year of the islands :) A huge difference between the 2 islands, though. With one thing in common (besides gorgeous beaches and warm weather): people in the South know how to enjoy their lives. Thankfully for us, we have never been truly caught in the work-home-repeat circle of life in Canada (and North America, in general), but we can still feel it around us. We (the generic 'we') always seem to rush somewhere, to be in motion. The entire society seems to be afraid of stillness. Not so much in the Caribbean: they are ok doing absolutely nothing. Which is comforting to me, I like to stop and stand still quite often. How else would you capture the moment? Same ocean, different view - gorgeous beaches, the sunset is the view from our hotel - very relaxing, the team (having fun now and then, and working hard at training), plus a visit through the rain forest, over the mountain, to the largest radio telescope in the world, the Arecibo Observatory. And, of course, the hat! Back home we barely had time to get back into the rhythm, with Easter coming and passing quickly afterwards, and the busy schedule at all our respective schools... and we had to go again. This time to Tucson, AZ, for the Canadian Trials for PanAm Games. We spent about 10 days in Arizona, in the middle of the desert, in a very dry heat and dry everything. Florin loved it. William and I - meah. Yes, it is nice to be in a warm area, absolutely. But after a few days I had enough of the acres and acres of dry, cracked land, with nothing but cacti. I am not the type of literally hugging a tree, but I do draw comfort from touching the leaves, the grass, I love just lying on the ground and watching the clouds in the sky. Towards the end of the first week, all I could think of was "if I want, I cannot hug a tree here!". But the area is absolutely gorgeous otherwise, a great place to visit. This time we explored a little bit more: we went to the Museum Desert, to an Airplane museum, we hiked those mountains you see in the middle / bottom picture (another strange feeling: to hike and be surrounded by cacti), we even stopped at a lapidary / metal-smith store on my birthday. Yes, of course I bought myself something - it was my birthday, after all! 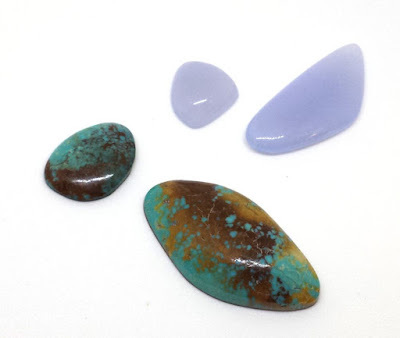 Beauty 101 :) Two (very expensive) Blue Chalcedony cabs, and two (decently expensive) Hachita (New Mexico) Turquoise. I am still in hoarding mode with them, admiring them and deciding on a design. I know what I want to do with both sets: a pendant and a ring. It's the pendant that I am still thinking on how to make it, but I will come to a conclusion soon: I have decided to use what I already have around in the house, 'cause I do have tons of beautiful gemstone cabs that are waiting to be used. And wore too! This is my Tutti-Fruity story - Happy Anniversary to my lovely hubby who's training part of our high performance team away from home right now. 19 years together - can you imagine?! I just checked and the stone for 19th anniversary is Aquamarine. Which is the child's birthstone too. But check this one out: next year is our 20th anniversary... gemstone? Emerald!! Whose birthstone is that, eh?! 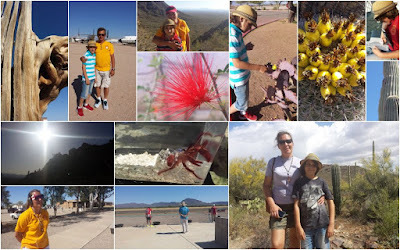 So lovely to see and hear about your recent explorations, Alicia :) If you can't get away from the craziness for awhile yet, at least you have the wonderful memories and photos to soothe you (and remember this extra special season in your son's life before "that time" begins LOL). do you wonder how you have gotten it all done so far?! but worth the effort for all the beauty you got to experience ~ what a fantastic year for you all!!! Congrats to your husband on his impressive position and again, Happy Aquamarine Anniversary :-D We are celebrating our Emerald in a couple weeks. Looking forward to seeing what you make with those !Gorgeous! cabs!!! Congratulations to Florin on his appointment. Happy Anniversary to you two again, and happy belated birthday. I bet it was wonderful going down to the Caribbean in Feb. to enjoy the fun and sun and then to Puerto Rico one place I would love to go to. Arizona is beautiful place to visit, but I am with you l love green to much. Gorgeous cabs! You just go ahead and hoard those beauties for as long as you like.